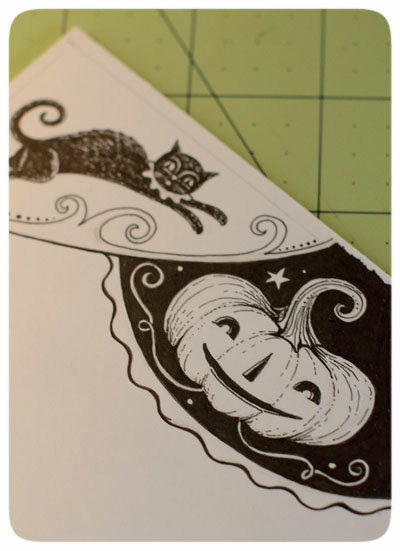 * Just a crop on one of my new Halloween notepads for fall 2011..... If all goes as planned, you'll be able to purchase these through Primitives by Kathy! * Another crop on this silly character against a field of purple yumminess... I was just playing with color here! PS.. 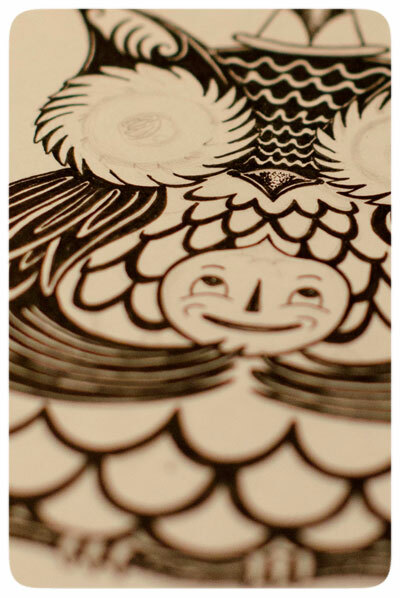 I still haven't finished inking in the fanciful owl yet! There have been too many distractions around here, but he's waiting for me on my drafting table and he STILL has no eyes! February is that time of year for me to pull out the 'ol sketch pad, pencils & erasers, and then the ink pens and crisp illustration board naturally follow. It has certainly been a while since I have spent days upon days at my drafting table, drawing fun characters for future products, and I must admit that I am thoroughly enjoying it. I was a little nervous that I would forget how, but luckily, the whimsical ideas are flowing well. Sure, at this stage, the drawings aren't perfect, but I have learned to "breathe through" the lines as my pen touches the board and to allow my breath to help keep the lines flowing and smooth. At the end of the day, my right hand feels a bit stiff, so a little yoga here and there is helping keep the balance. If only I could keep to this nice relaxing pace for the rest of the year.... haha! I will enjoy it while it lasts though and draw as much as I can now before I must revisit the workshop to sculpt and sculpt some more! It was late the other night when JP snapped a few candids of me while I shooed him away. I just loaded the photos today and decided to share a few after all. 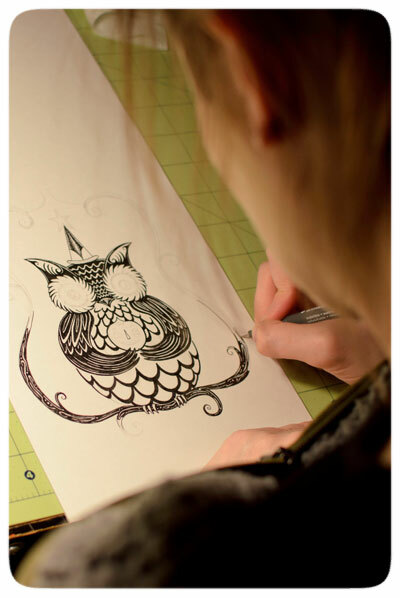 As many of you know, I LOVE incorporating owls into my designs. They have such fun character and texture, so this particular illustration has been a fun play on stylization. It's certainly taking its time to evolve, but I have a feeling it will be a hoot! As you can see, I like to wait till the end to add the eyes, partially because I hesitate out of fear to add them, but also because they truly bring the character to life. * Eventually I will paint this owl, but for now I need to "commit" to the eyes and finish the whimsical chandelier-style branch that surrounds him. He will be quite stylin' on a shirt or bag or card or or or....... We'll see! 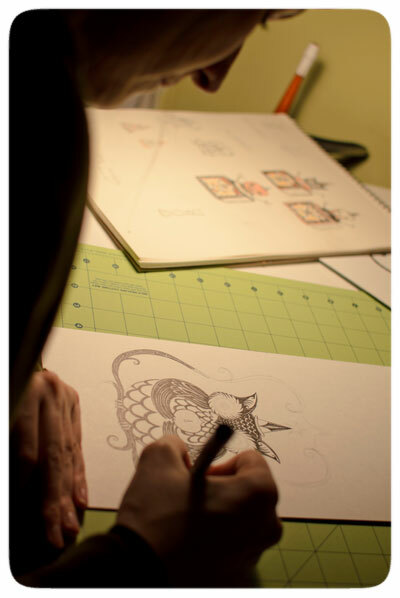 * Another candid of me busy at work on my stylized owl. 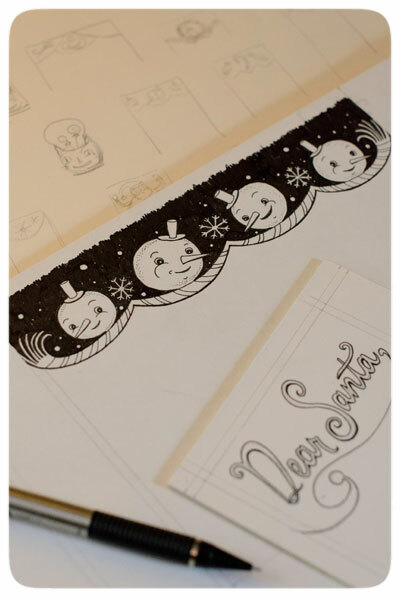 Off in the distance are recent sketches for Halloween box containers that have been approved by Bethany Lowe Designs for 2012 production. Now, I just have to illustrate those graphics too! The to-do list is growing!!!! 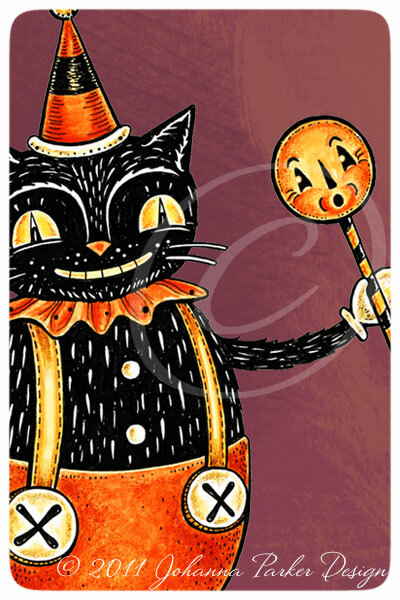 * Another black cat candy pail image that I am almost finished with has been staring at me for days. The shading and highlights are created by a series of dots or lack there of. 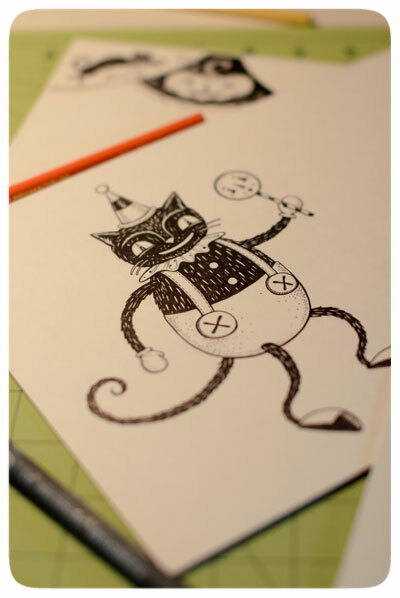 I find myself using stippling in both my illustrations and on my painted folk art pieces. I know it sounds odd, but I love dots! 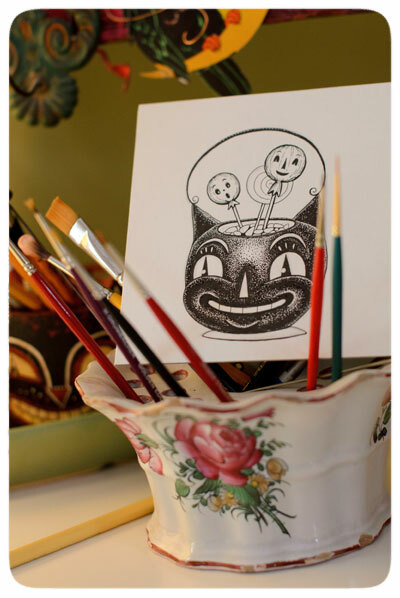 This drawing is slated for a Primitives by Kathy notepad and perhaps some Zazzle products as well. * Here, another notepad design is in the works. Of course, a splash of orange in various hues will bring this image to life! 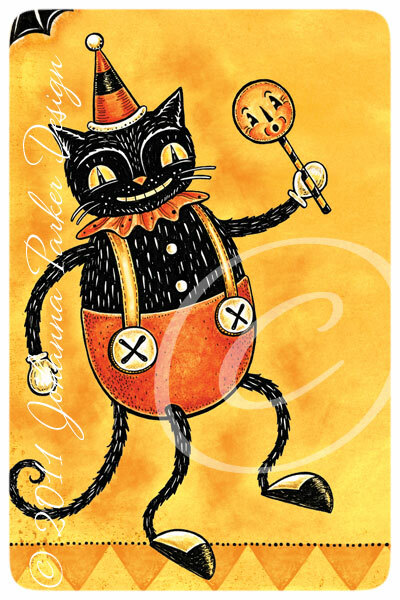 If you missed my Web Sale yesterday, you'll find that all of my Halloween one-of-a-kind pieces found homes, and I thank ALL of you who played along. It was an adrenalin rush! 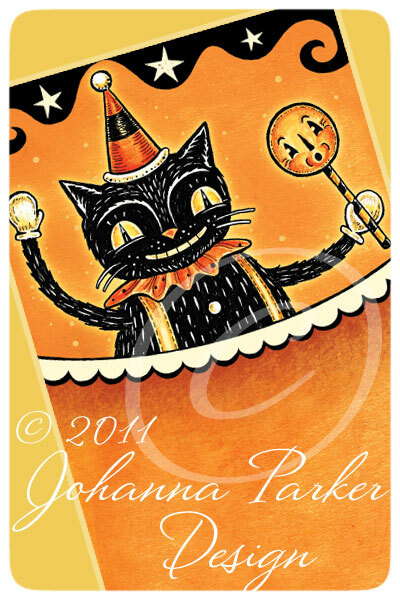 However, I do still have a few sets remaining of my signed Halloween reproduction combos which include a series of my illustrated notepads!... I'll post their photos below, and you can click on them for details and an enlarged image. If you'd like a set for yourself, just send me an email! Many thanks! © 2008 Johanna Parker Design * Designs in this post are the property of Johanna Parker and may not be used without permission.